When I visit my sister and brother-in-law I always like to cook a big Sunday breakfast. They love it when I make a giant tray of biscuits that they can feast on all week after I’m gone. This are a true southern staple. Pre-heat the oven to 450 degrees. In a large mixing bowl, mix the butter, flour, baking powder and salt with a fork. Once the butter is fully incorporated into the flour and resembles course meal, add the cream and milk. Quickly mix the liquid into the dry ingredients and turn out onto a floured surface. Squeeze the dough together until it forms a full mound of dough. Roll the dough out with a rolling pin to 1-inch thickness. Using a glass or a biscuit cutter cut out biscuits and re-roll the dough after each round of cuts until the dough is all gone. Place the biscuits onto a silpat baking mat on a cookie sheet. 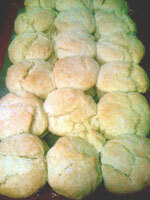 The edges of the biscuits should touch. Paint the top of the biscuits with the melted better and a pastry brush. 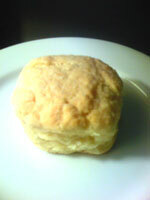 You can sprinkle the biscuits with parmesan cheese, cracked pepper or herbs if you want. 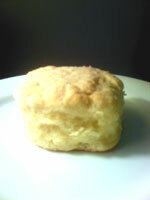 Cook the biscuits in the middle of the oven for 20 minutes or until the biscuits are golden brown.